Praslin Island (a prime area) is Seychelles’ second largest region. The world’s smallest nature reserve Vallée de Mai is located here. It protects the endangered black parrots, which are actually brown-grey in color and now only number 300; the noisy Seychelles passerine birds; and the ancient palm tree coco-de-mer, which produces the world’s largest seed—the double coconut, or sea-bean, once used in medical preparations and taken as an aphrodisiac. Its export has long been ceased. Less developed than Mahe, Praslin has unspoiled coastal vegetation. The road network that surrounds almost the entire island links the tourist spot Anse Georgette and the administrative localities of Grand Anse and Baie Sainte Anne. There is no road access directly connecting Anse Lazio—another popular tourist destination, the ideal place for swimming and snorkelling—and Anse Georgette. A number of large hotels line both coasts. A road cuts from east to west, making Vallée de Mai easily accessible from either side. A Thai developer recently opened a boutique hotel and residential resort on Grand Anse Beach, and has started construction on other beachfront properties. 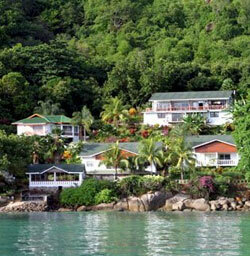 Praslin is also anticipating the opening of Raffles Estates’ resort hotel and private residential beachfront villas. Full-time ownership is offered. Residential villages are scattered around the island, but population and demand for housing are higher in Grand Anse, Baie Sainte Anne, and Anse Volbert. The Praslin Island Airport has connecting flights to and from Mahé.